Many people gather in Moscow for to celebrate the beginning of Vladimir Putin's fourth term as president. 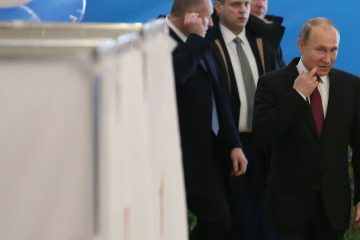 In the days following Vladimir Putin’s “electoral victory”, we have seen the usual mix of indignation, humor and derision aimed at the deplorable situation within the Russian Federation. People laugh at Russia, they mock Putin, they create memes and they treat the event as nothing more than the most recent joke to hit the internet. Why is it that we have such a passive reaction to a man who is singlehandedly doing his best to destroy democracy not only at home but abroad? Why are we so passive when we look at the multiple assaults that Putin’s Russia has mounted on not only its citizens but neighbouring states as well as countries such as the United Kingdom, France and The United States? 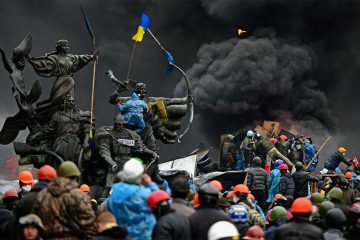 The simple fact is that we have an increasingly hostile rogue state being run by an authoritarian President, who despite repeated attempts by the west to find common ground and to foster cooperation has become increasingly hostile to the point of ordering military action against NATO and the EU; he has even ordered invasions on neutral states such as Georgia and Ukraine for the sole purpose of isolating these countries from powers he views as the enemy. The dreams of a post-soviet Russian ally are, for all intents and purposes, dead. The idealists who believed that Russia would cooperate with and work alongside the western powers have been proven wrong. The hopes that Russia would adopt the ideas that form the backbone of western democracy have been dashed. 18 years of Putin governance has led to increased corruption, a loss of human rights, the veritable crumbling of its economic strength as well as the wholesale destruction of its international political standing. Furthermore, during the presidents’ soon-to-begin fourth term we can expect the same aggressive “diplomacy” from the ex-KGB lieutenant colonel. In an attempt to continue the revival of fortress Russia, we can expect more clandestine operations across the Balkans and the European Union. Events such as the attempted murder of Sergei Skripal and his daughter, the cyber-attacks on critical western infrastructure, the consistent disinformation campaigns and the attempts to break the NATO and EU alliance networks will undoubtedly continue without remorse, and probably without an effective response. The issue we face with the continuation of the Putin regime is the strongman himself. 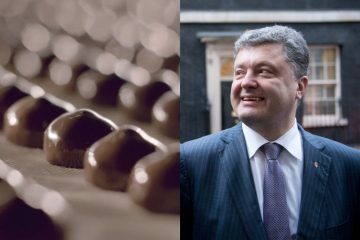 As head of state he prefers to be “A difficult partner” to his neighbours, and in adapting soviet-era clandestine tactics to the modern information era, he has found additional ways in which to aggrieve and frustrate the nation states that surround him. 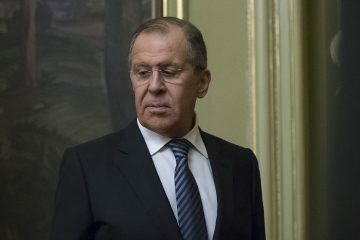 He has gone out of his way to interrupt western efforts to “democratize” the Balkans, frustrated attempts at rapprochement with states such as Georgia and Ukraine, and has made it a key goal of the Russian state to spread its influence across the European and American continents. Putin even appears to be trying his best to drive a wedge between the two long-term allies and impact the efficacy of the North Atlantic Alliance. And this is not something that will end anytime soon. 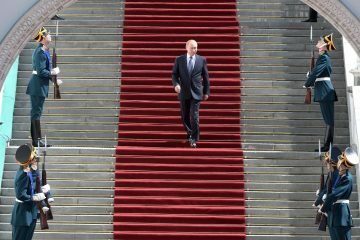 If Putin’s past behaviour is to be an indicator of his future plans, he will undoubtedly begin to seek the successor who will carry his legacy and continue his work on the international stage. The danger in this hypothetical situation is that, while unpredictable and difficult to work with, politicians across the world are now accustomed to the way in which Putin operates. Any successor will be an unknown quantity, and in seeking to emulate Putin could behave in dangerous and unpredictable ways that could destabilise the regions immediately surrounding Russia. However, what can we actually do against the blatant acts of Russian aggression that have thus far been met by nothing other than economic sanctions and slaps on the wrist? There is no interest in intensifying the existing sanctions against Russia, as even with the near-crippling effect they have had on the Russian economy and on the population of the country, it has had no effect on the strength of the government forces that uphold the current Russian regime. Likewise, the seizure of assets from Putin and his allies is unlikely to be as effective as many believe and would be likely to further antagonize an already uncooperative partner. 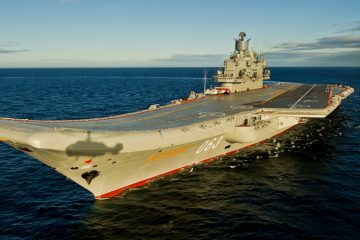 Likewise, the hawkish among us who feel we need to show military strength in order to dissuade Russia ignore the fact that this is likely to provoke further military action, which could range from intensified cyber-attacks on European infrastructure to further interference in regional alliances. Of course, even Putin is wary of taking further military action against NATO and the EU, especially with the (admittedly slow) increase in military readiness across Eastern Europe. However, that does not mean that he wouldn’t react with military force if he felt that Russian territory was threatened. Cooperation with Russia will ultimately lead to a continuation of the status-quo, where Putin runs roughshod over the rules and regulations that govern international diplomacy and this option would leave very little in the way of viable solutions to the man who is currently positioning himself as the enemy to western states. Even just doing nothing carries an incredible risk for the west. Putin has engineered a situation where all actions lead to some form of conflict with Russia in some way, shape or form; and the west will likely need to call his bluff if they are to resolve the situation without backing down and further emboldening the man who has positioned himself as their enemy.